Reader Fred sent this. I guess I'd call it an UN-chuckle du jour. I'm glad I live in rural Iowa where it is still acceptable to say Merry Christmas. We attended the school Concert Band Christmas Concert. The Junior High band played three carols for us to sing along to. It as great! Joy to the World, Silent Night, and We Wish You a Merry Christmas. We have problems here but nothing like the big cities. Merry Christmas to all. God Bless us, everyone. 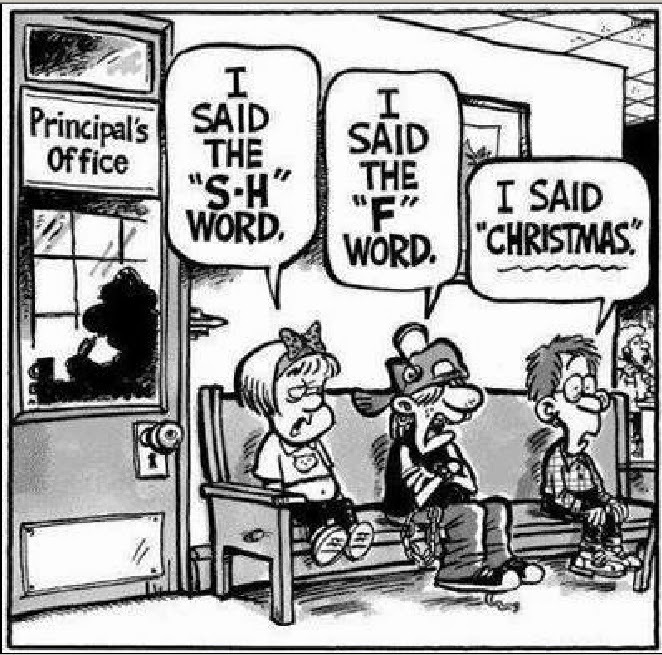 Texas passed a law in 2013 protecting teachers and administrators within schools, allowing them to say Merry Christmas without fear of "consequences." While it is unfortunate that this kind of law is even necessary, I am grateful that Texas has enough sense in the legislature to address these issues. If it makes you feel any better at all, my kids' public school Christmas programs are called Christmas programs, and for the past two years have featured Christmas songs on the order of "Follow the Star" and "O Little Town of Bethlehem" in about 2:1 ratio with the Cute Secular Songs For Children. This in a school district that is by and large so liberal that I would describe it as being "perpendicular to common sense" (ie intersecting it only once and not even running in the same direction). 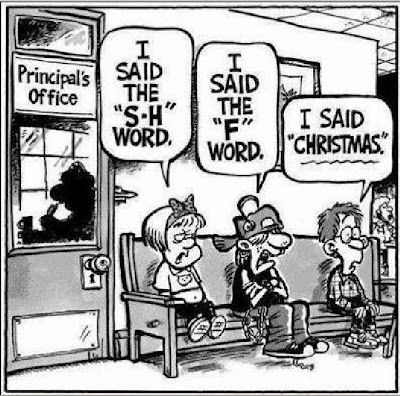 Maybe people are finally starting to get fed up with all the worthless, repressive PC horsecrap.